Twenty years ago, customer journey mapping was much simpler. Your customers likely saw an ad in a magazine or on television and then went to a brick and mortar location to make the purchase or made an order over the phone. Simple, right? Not so today.... With all the digital devices your customers have access to (television, smartphones, tablets, desktops, laptops, etc), the customer journey can become much more convoluted. Consumers may hop on their tablets to research a product, and then later that week, use their desktop computers to place an order online. There are an unlimited number of ways that customers can move through the consumer journey, but one fact holds true: only 2% of customers buy a product on their first visit to the website, meaning that understanding the various twists and turns on your customer journey is crucial to recapturing lost sales opportunities. 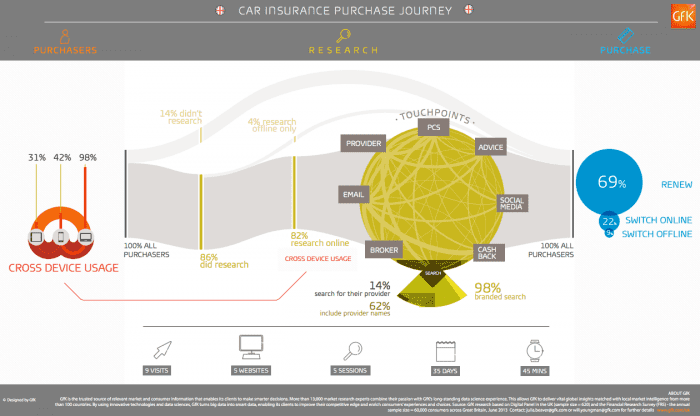 This financial services customer journey mapping example from research analysts GfK shows the complexity of today's customer journeys across multiple devices and through time, particularly for high involvement or high-value purchases. For personalization to be truly effective we need to deliver messages based on how our audience has previously interacted with us and the device they are using or, where known, their current location. Because the customer journey includes so many types of technology, businesses can benefit from building adaptable cross-channel experiences for their customers. While it’s true that marketing and retargeting may help you capture and recapture your customers, you can also take preventative measures to stop them from falling off the path to purchase. Three of these preventative measures are known as the three Cs: create, capture, and calibrate. By creating ecommerce sites that are responsive across devices, capturing your users’ attention with fast-loading content, and calibrating your experience to your unique customers, you can prevent customers from falling off the path to purchase, resulting in increased conversions and revenue for your company.